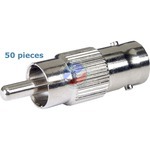 Connectors - BNC-02BLK - Only $29.95! BNC Female to RCA Male Adaptor Connector. The BNC- 02 is used to connect a Female BNC connector to a Male RCA adaptor, thus converting your BNC signal into RCA.